We are offering two classes that will help you explore your creative side! After you take your digital pictures, now what? Almost all digital photographs need more “processing” to get the most out of the image. In this three-hour Introductory class on Friday evening, Carlyn Iverson will introduce you to Lightroom. Lightroom is a photo editing and management software program. Developed by Adobe, this program is designed to help you manage large quantities of images, and edit them as well. Lightroom can make your images look much better easily and efficiently. 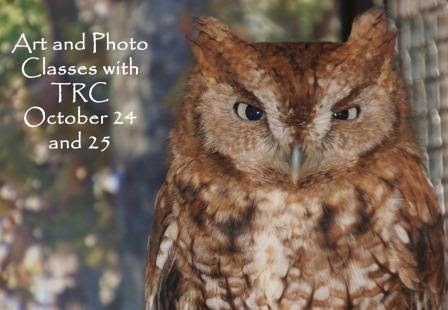 This class will meet at Carpenter from 9:00 am - 11:00 am to photograph some of TRC's education raptors in natural habitats. Carlyn Iverson will guide you on angles, light and working around live animal subjects. Please bring your own equipment, and breakfast and/or lunch. Please dress for the weather.